Work specification and example data. Label external dimensions (material) 290 mm x 200 mm, material thickness 5 mm. Complex 2D milling in different depths, countersunk outline lettering using two tools, holding webs and milled out portion in layers created using eSIGN. Through the simple, intuitive operation handling using eSIGN requires no special instruction. Nevertheless, the program is very comprehensive and effective. Therefore, to become acquainted with it , please read through the General Instructions CAD and Label + Series label beforehand. If you have questions on the operation, then please first make use of the program help. With already activated function you can access this using or using the aid Program Help [?] and click-on the function. Designation of the functions to be selected. In the following description a short notation is employed for the selection of functions. The areas are respectively separated through point ‘.’, e.g. Draw . Polygon . Rectangular radius outward. The function can be found in the menu Draw under Polygon in the sub-function Rectangle radius outward. 1 Adjusting of the work limits. Set the working area in Layout . Limits with width dx = 290 mm and height dy = 200 mm, zero point = central (comp. Graphic). You can import your vector data in EPS/AI, DXF, HPGL format or also very comfortably input them in your program. 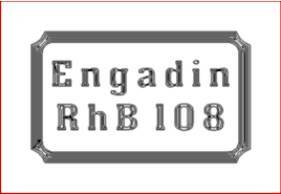 eSIGN posses very effective functions for the creation of graphics. 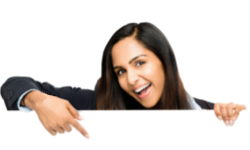 The graphic required here is generated rapidly and completely in eSIGN. Select CAD the function Draw . Polygon . 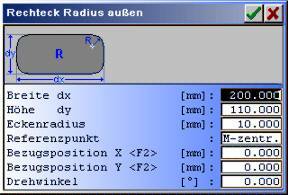 Rectangle Radius inward and enter the parameters as in the graphic. You generate the 2nd parallel displaced frame using CAM . MillOffset and a setting of 5 mm. The offset should be calculated inwards. For this the must be available with negative direction of rotation (clockwise). The direction of rotation of the paths can be monitored using the aid Graphic position marking. As required, you can change the direction of rotation using Process . rotate track(s). 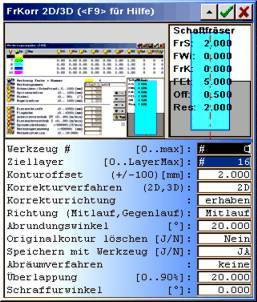 2.3 Input text field frame. For the inner frame select the function Draw . Polygon . Rectangle Radius outward in CAD and enter the graphic. With this, you have entered all frame elements (comp. graphic). For text input select Text . edit line. 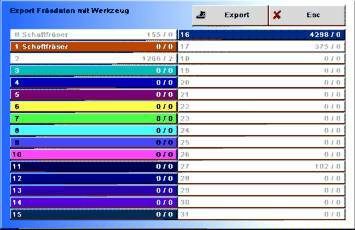 Place the cursor on any desired position within the graphic and input the text and the parameters in accordance with the image. For the following offset calculation outline lettering (F…)must be selected (here F1000140). Using Adjustment . Harmonisation the text is placed automatically in the centre of the graphic. In order later to calculate milling paths for the text together with the individual graphic elements, the text should be converted into milling paths. For this change into the menu operative line mark both text lines with a rectangle around the text reference point and select the function Text > Graphic. Here you can select whether, following conversion, you wish to have text only (delete text) or text + Graphic (retain text). If, at the end of this work, you wish to continue to use the data it is sensible to retain the original text. With this, the creation of the graphic (CAD) is completed. Continuing in the CAM area. 3 Calculate the milling paths. The milling takes place at various depths (2 mm, 4 mm and 5 mm). Therefore the milling path calculation must take place in several steps. The processing takes place form top to bottom, i.e. starting with the least milling depth. For the processing two cylindrical tools are employed. Data of the tools in accordance wit the graphic. The tool (TSt = 1, CuT = 2.0 mm) is employed for several milling depths. The incision depth must respectively correctly set before the milling path calculation. The tool (TSt = 2, CuT = 1.0 mm) is employed for the finishing milling and operates at the incision depth 4.0 mm only..
All milling paths are saved in the Layer #16 . For the finishing (milling in layers) you require the function Edit CAM (not embodied in eSIGN2D (ly)). 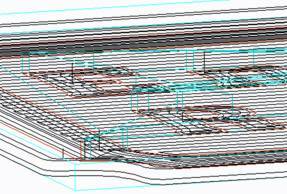 In eSIGN2D (ly) therefore, the milling paths should be saved in different layers (e.B. Layer #16 .. Layer #20 ). 3.1 Mill surface relief face for the engraving (Level 2.0 mm). Save the inner frame calculated under 2.2 using the marking tool and start the function CAM . MillCorr 2D/3D. Settings i.a.w. graphic. Incision depth for the tool (FEt) = 2.0 mm. 3.2 Mill outer edge (Level 2.0 mm). Select the outer frame input under 2.1 using the marking tool and start the function CAM . MillCorr 2D/3D. Settings i.a.w. graphic, however direction of correction embossed. 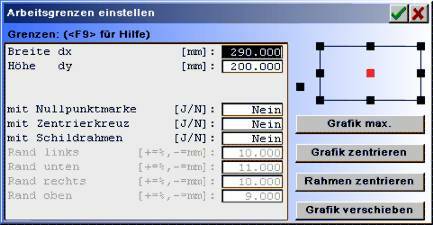 Incision depth for the tool (FEt) = 2.0 mm. 3.3 Roughen engraving (Level 4.0 mm). The engraving takes place with a depth of 2 mm, measured from the base of the previously milled pocket (comp. 3.1). Because the pocket has already been milled at 2 mm, the engraving is at a depth of 4 mm. in order to be able to more easily select the paths for the offset calculation, copy the inner frame calculated under 2.2 and the text field frame input under 2.3 wit the text in its own layer (e.g. Layer #2 . Select the Layer #2 as ActLayer. Start the function CAM . MillCorr 2D/3D. Settings i.a.w. graphic, however direction of correction incised and clearance process TrackPar. Incision depth for the tool (FEt) = 4.0 mm. 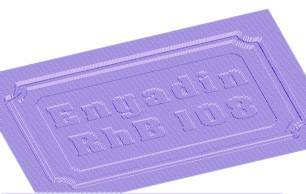 3.4 Smooth engraving (Level 4.0 mm). Start the function CAM . MillCorr 2D/3D. Settings i.a.w. graphic, however direction of correction incised and clearance process none. Incision depth for the tool (FEt) = 4.0 mm. 3.5 Make label available (mill out) (Level 5.0 mm). Additional contour offset = 2.0 mm. Incision depth for the tool = 5.0 mm. Select the layer with the calculated milling data ( Layer #16 ) and the function CAM . Holding web. Settings i.a.w. graphic. Using the cursor click-on in turn on the outer milling contour at the points at which holding webs are to be placed. The input is ended using the right Mouse key or the key on the keyboard. 3.7 Mill out in layers. Select the function Edit CAM. In the Object list you obtain all the previously created milling objects (#1..#5) listed in their sequence. the current object is marked in red in the graphic. You can offset the pointer to the current object and thus the object marking in Edit Object using first, last, one forwardand one backwards or using the cursor key of the keyboard (cursor upwards/downwards). The milling out takes place with an infeed of 5.0 mm. For most materials this is too much. In order to activate the layer processing select in Edit CAM the last object (#5) and in Edit Object the function rate of cut. Select the parameters i.a.w. graphic. With this, the milling paths are calculated with the depths 2.0 mm, 4,0 mm and 5.0. mm (residual depth). The tool moves into the material inclined at an angle of 30° for all depths. With this, the milling path setting is completed. 4 Graphic aspect and monitoring of the milling data. Before the export you can monitor the created milling paths graphically. for this select File . direct mill. In the export selection, select only the layer with milling data ( Layer #16 ). Other layers with data are marked white. 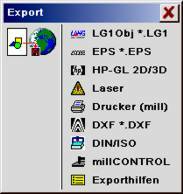 After Export select the Export aids in the list. The Export aids contain numerous function for the control and monitoring of the milling data. Using Norm projection you obtain a 3D milling path graphic in various settings. Using Volume aspect you can select a 3D graphic in various settings. 5 Export of the milling data in the data format of your machine. For data export, after the milling path monitoring, select the desired export path (e.g. DIN/ISO) Export aids in . Suitable for program configuration: eSIGN.. /iSIGN+.. /HCAM..
For eSIGN2D (ly) the milling paths must be saved in several layers. For this you require an internet connection! the file Engadin.SLD can be opened using Open . file. The example contains finished milling data, which can be exported with the export filters for further use with an engraving/milling machine, contained under File . direct mill. #0 cylindrical cutter CuT = 2.0 mm. #1 cylindrical cutter CuT = 1.0 mm. Layer # 0 : 2D graphic + text. Layer #16 : Milling data as described above.